-Gameplay optimized;. -Bug fixed;. -Graphics polished. 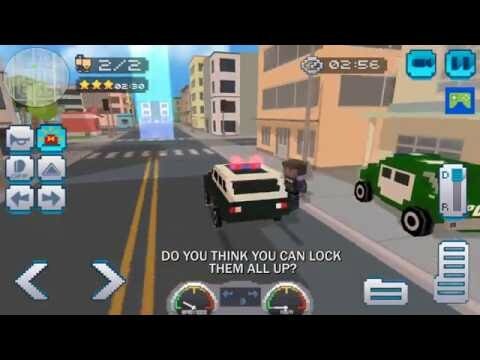 This blocky cop car simulator is all about catching the wanted criminals on the blocky roads and putting them behind the prison bars in this cartoony crime city simulator. A mega craft game is nice, but nothing beats an adrenaline-filled police shooting game. That is why we developed a mega craft game and a police shooting game in one! While you are catching the wanted criminals in the big open world of Blocky City: Ultimate Police, the ultimate blocky cop force is looking for a new police star in their squad. Make sure you stand out from the other police officers in this mega craft police car simulator. Mega craft ultimate cop force skills are what they look for so make sure you handle the blocky cop cars well and complete all the challenging blocky cop cars levels! ✔ Nerve-wrecking mega craft blocky cars levels in this police car simulator! ✔ Ultimate police force skills are needed to complete these levels! ✔ Unlock the best blocky cop cars in this cartoony crime city simulator! ✔ Adrenaline-filled police shooting game with mega craft graphics! ✔ Become the new star in this police shooting game and blocky roads game!